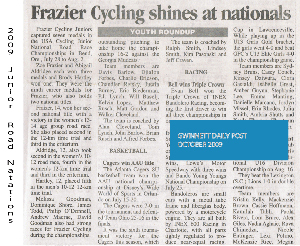 Frazier Cycling in the news! Davis Branyon, 2012 Jr National Crit Champion for Men 10-12. 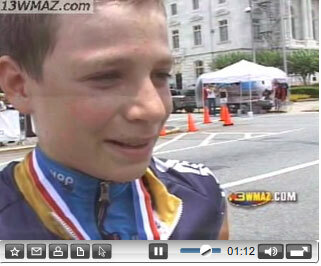 MACON, Ga. — Russell Tindol, a 16-year-old cancer survivor, was the winner in the Junior’s Division (ages 15-18) at the 2010 1st Annual Macon Cycling Classic, held on May 1, in Macon, Ga.
Russell is a member of the pest control industry’s Tindol family, managing partners of Allgood Pest Solutions. His father is Mike Tindol and his grandfather is Bubba Tindol. Mike Tindol, also a competitive bicyclist, got his son involved in the sport by enrolling Russell in Frazier Cycling, a junior cycling program started by one of his riding partners. In a recent Podium Insight interview, Tina Pic discusses how the Frazier Cycling junior development program can grow the base of women cyclists. 1-21-10 PODIUM IN SIGHT interview with Tina Pic. Junior Cycling Program adds to Roswell’s "Bicycle Friendly Community"
The City of Roswell is known as a cycle-friendly place to live. 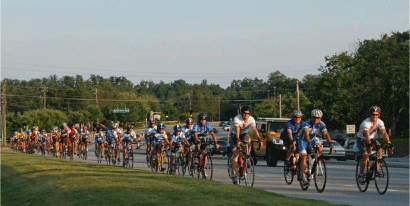 It is the only city in Georgia to earn the national "Bicycle Friendly Community" designation. Bike Roswell!, a cycling advocacy group, works with the City to promote safe cycling and encourage more cyclists with improved parks and roadways. The City is home to the Historic Roswell Criterium held annually in downtown Roswell. Widely attended by spectators and families, this popular event brings 700 race entries from amateurs and international pros. In addition, cyclists can rely on Roswell Bicycles, the largest professionally staffed bicycle retailer in Georgia to continue to offer the cycling community superior service and products. What more can a Bicycle Friendly Community ask for? 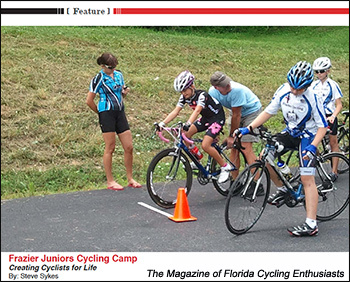 How about a junior road cycling program for youth ages 7-18 run by professional USA Cycling coaches who teach basic cycling skills through competitive race strategies? Roswell Bicycles and Frazier Cycling have joined forces to start a new competitive junior road cycling team based out of Roswell, GA. 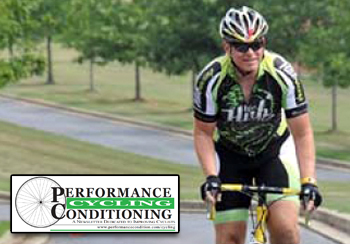 The new Roswell program targets junior cyclists (ages 7 -18) in the Roswell/Alpharetta/Marietta area. 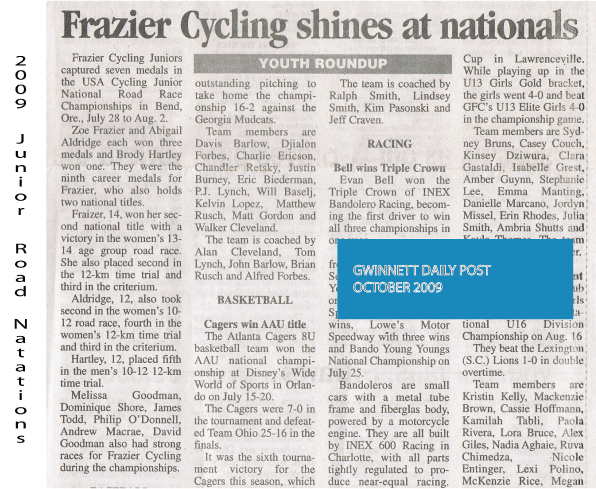 Frazier Cycling has the largest junior development program in the southeast based out of Suwanee, GA, and has produced 3 national champions and earned 17 national medals. Recognized by USA Cycling as a role model for other junior initiatives, the Roswell program implements the "team approach" to competitive cycling and the importance of sportsmanship and character development. Backed by Roswell Bicycles’ sponsorship and support the new program will surely become one of the southeast’s powerhouses in junior cycling. Roswell Bicycles (roswellbicycles.com) is ranked one of the top 100 bicycle retailers in the USA and supports cycling at all levels of participation. LAWRENCEVILLE - Bicycle racing enthusiasts will converge on Gwinnett County this weekend to support a good cause and to try to take home a piece of the $3,000 prize pie. With the fourth annual Allgood Cycle for Parkinson's weekend kicking off Saturday, people probably aren't aware that bicycling and Parkinson's disease have something in common. "While it may not seem that cycling and Parkinson's disease are related, there is currently an innovative research study that proves that cycling does indeed reduce the symptoms of Parkinson's disease," Cathy Frazier of Suwanee-based Frazier Cycling said. 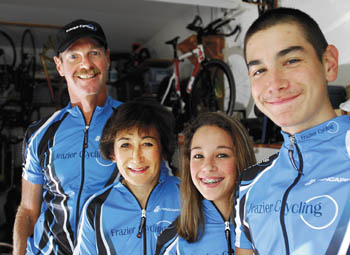 From left, Ralph, Cathy, Zoe and Nicholas Frazier put together a race that is run by Ralph and Cathy’s company, Frazier Cycling. Cathy has Parkinson’s and the race benefits the American Parkinson’s Disease Association. LAWRENCEVILLE - Cycling has been part of Cathy Frazier's life since she met her husband Ralph, who has been heavily involved in the sport for more than three decades. It's the family business, with Frazier Cycling run out of their home. Both their teenage children, Nicholas and Zoe, race. They have jerseys hanging in the foyer, boxes of Powerbars and bikes are all over the house. "Cycling has been part of my life for a long time," Cathy said. Eleven years ago, Cathy was diagnosed with Parkinson's disease. Five years ago, she was on the forefront of a pioneering study linking cycling and an improvement in the symptoms of Parkinson's, a progressive brain disorder that affects the body's ability to control movement. Russell Tindol knows a thing or two about fighting uphill battles. 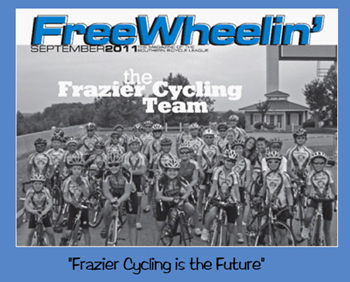 Most of the time, it's been while the competitive cyclist was perched on his road bike, strapped in a helmet and climbing an incline surrounded by his teammates from the Frazier Cycling Juniors of Suwanee. But now, the 15-year-old from Lawrenceville wages a different battle — against cancer. And his teammates are still by his side. Cyclists, family and friends brought out their bikes to "Ride for Russell" Wednesday night in Duluth. The 15- to 20-mile ride began at CycleWorks as a joint fund-raising effort between the Frazier Cycling Juniors and Rally Across America, an annual charity bike ride sponsored by the nonprofit group Rally Foundation for Childhood Cancer Research. The signature races in Gwinnett Bike Fest's final day were as hot as the mid-90 temperatures at the Gwinnett Progress Center near Lawrenceville. And it was a 15-year-old from Suwanee who may have made the biggest impression. David Goodman, a rising freshman at Collins Hill High School, won two races Sunday on the 2.7-mile loop circuit course that hosted nine races of varying lengths and skill levels. After winning the Junior 15-16 age division in the morning, Goodman blew away the field in the men's Category 4-5 race in the afternoon. He took the lead with two laps to go and was literally forgotten about by the rest of the field. Goodman's margin was so wide - about 9 seconds over the rest of the pack - that second-place finisher William Santana [corrected], didn't realize he wasn't the winner until the top three riders were to step on the podium for their awards. It was Goodman's first win in a men's race and the first on his team from Suwanee-based Frazier Cycling, which dominated the youth races in the four-day, four-stage race. "I just caught up [to the group] and went around them and kept pedaling," Goodman said. "It's the first time any of us has done it, so it shows it can happen. . .